Fn layer with the cursor keys, numeric keypad, function keys. The possibility of firmware without additional hardware. Had tried a number of key locations, in the end it turned like a Truly Ergonomic. The ability to use custom hardware layouts on any computer without having to install the operating system. Separate power key language and layout does not switch, namely, includes language, allowing you to not look at the current state of the layout. The ability to edit the firmware and download it without any additional equipment with built-in loader. The ability to use over the notebook keyboard may add trimmed gel mouse mats. There is a technological hole in the shape of a cat's head, through which will not hurt tachpoint notebook keyboard. 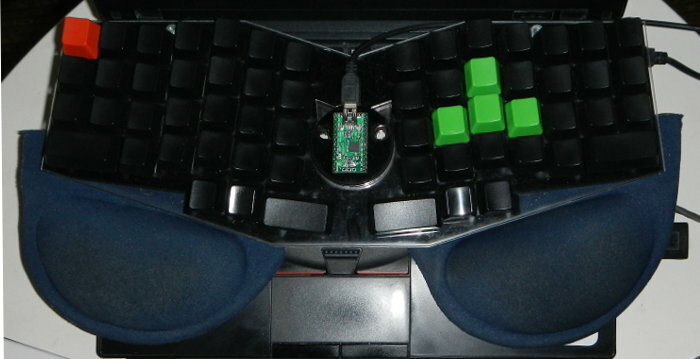 Placing the control unit, the digital unit and a number of function keys on the basic alpha-numeric keypad. Navigation buttons at hand, does not require the displacement of hand print starting position. 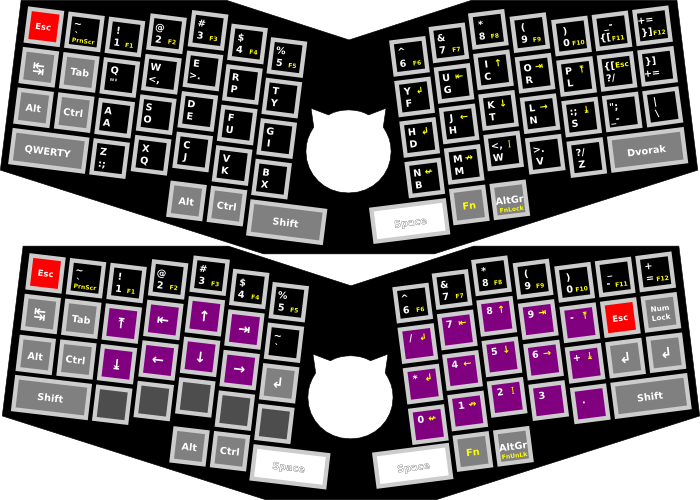 Ability to use different keys on the thumb, it is convenient and Shift on the left thumb, and Ctrl comfortable with him.